Jalapenos lose their heat when they lose their seeds. Remove the seeds and the white vein and discover the taste of a jalapeno instead of its heat. Be careful NOT to touch the seeds and vein with your bare hands- the oils from the pepper will stay on your skin for hours. Coat grill rack with cooking spray; preheat grill to medium-high. Cut off a thin slice from one side of each pepper, leaving stems intact; scoop out seeds. In a medium bowl, stir together cream cheese, 3 tablespoons shredded cheese, scallions, cilantro, salt, garlic and paprika until blended. Fill each pepper with about 2 teaspoons cheese mixture; sprinkle remaining 3 tablespoons shredded cheese evenly over peppers and sprinkle with more paprika, if desired. 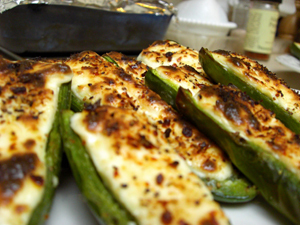 Reduce heat to medium; grill, covered, until bottoms of peppers are lightly charred, peppers are tender and cheese is melted, about 7 to 8 minutes. Let stand 5 minutes before serving. This entry was posted in Metabolic Medical Center Recipes, Modified Profast (Fast and Flexible) Recipes, Nutriplus Recipes (Balance Your Pyramid), Party & Entertaining, Salad, Uncategorized, Vegetables and tagged Cheddar cheese, cheese, easy, fat free, garlic, grill, Jalapeño, side dish, Vegetable, vegetarian by foodies4mmc. Bookmark the permalink.